An adder warms itself in the sun (photo Dominic Markus). 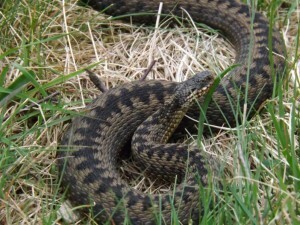 Among the lovely creatures you might see as you walk in Cowal are adders. 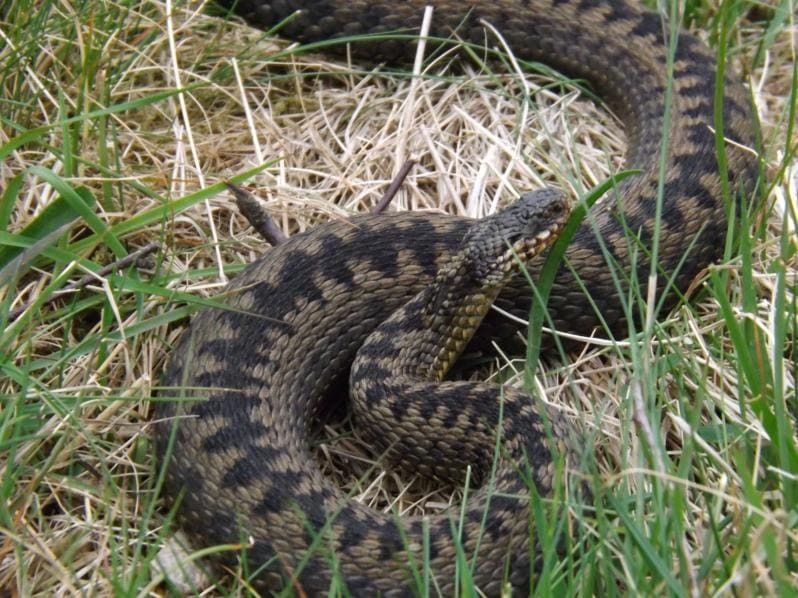 Grey or brown, with a distinctive zig-zag strip running down her back, the adder is hard to spot. Most of us make so much noise charging about that the snake has heard us coming before we get anywhere near her, and has made herself scarce. Here’s a nice piece of serpentine etymology: the Gaelic word for ‘adder’, or more generally for ‘snake’, is nathair. It’s a feminine noun, which is why the fleeing snake above is a ‘she’ – though of course half of them are male as well. Related to Gaelic nathair are Welsh neidr, Latin natrix, and Old English nædre, all meaning ‘snake’. You can see the connection. How did it become adder in modern English? It comes from the use of the phrase a nædre, and the n moving back, so that it became an ædre – an adder. On a fine morning, go quietly on a south-facing hillside, and you may be lucky enough to find her warming herself in the sun. And if you see her, what do you see? Well, you see a snake, of course. But whenever we look at something we see it with eyes formed by countless stories, associations, memories. The snake has many associations. Perhaps the dominant one in the western imagination – at least now – is that of the dangerous, slithering and tricky animal. Well, adders are not dangerous to humans (except to the very young and the very old, perhaps), and they would far rather get away from you than meet you. But we have inherited the story of Genesis: the snake tempting Eve with a fruit, bringing about the Fall from Paradise, and all the sorrows of humanity thereafter. It’s a story that looms large: ‘the serpent deceived me’, as Eve said – Mheall an nathair mi. Again, they get a bad press, though here the snakes are doing God’s bidding. He sent them. But what harms Israel, strangely, becomes their salvation. The story continues: ‘So Moses made a bronze serpent and set it on a pole. And if a serpent bit anyone, he would look at the bronze serpent and live.’ A strange and primitive story: what hurts you is also, if you look at it, what saves you. And it is this strange story which Jesus refers to in John’s Gospel (3:14): ‘As Moses lifted up the serpent in the wilderness, so must the Son of Man be lifted up, that whoever believes in him may have eternal life.’ Referring to his own death, or perhaps to his death and resurrection – for both were a kind of ‘lifting up’ – Jesus tells his hearers that it is by looking at him that they are saved. He is the fulfillment, if you like, of Moses’s snake. Later writers thought about Christ as snake-like in a different way. Classical and medieval observers knew about the snake shedding its skin, and they saw how they did it by creeping through a narrow hole. This became a metaphor for Christian life, reminding us that we should shed our old selves, our old lives and habits, in a life-long process of renewal, and that we must do it by ‘entering through the narrow gate’ (Matthew 7:13) – self-denial, generosity, living for others. A snake appears in the margins of the Book of Kells (circa AD 800), where it may represent Christ. That shedding of the skin was not just about shedding our old habits to become new. It was about resurrection. As it got older, its skin drier, the snake shed its skin and was made new again. It seemed to acquire a new life. From the fourth century on, therefore, Christian artists regularly depicted the snake as pointing towards Christ himself. How multi-layered the story is. It begins with a snake leading humanity to disaster, and ends with the Jesus-snake leading us to eternal life. In the Middle Ages, nothing meant only one thing.